I recently purchased a 2005 Gary Fisher Zebrano for commuting to and from class (about 2 mi.). Everything was going great until yesterday. I noticed the tires needed some air badly, so I used a standard floor bike pump and a pressure gauge to air the tires up to 50psi (reccommended is 60-80psi). I got up this morning to ride to class and found that the rear tire would only turn a little ways before being stopped by the brake. It turned out that the rear rim had been pushed out by the internal tire pressure and had caused it to seperate from itself, in what looks like a split in the rim wall where the brakes are applied (see pics). Now, these are good rims (Bontrager Camino Series 6000 with Bontrager Select Invert 700cc on em). I didn't overinflate the tire, what could have caused this to happen? And is there any way to repair the rim? I REALLY don't want to have to buy a new one. Thanks in advance. 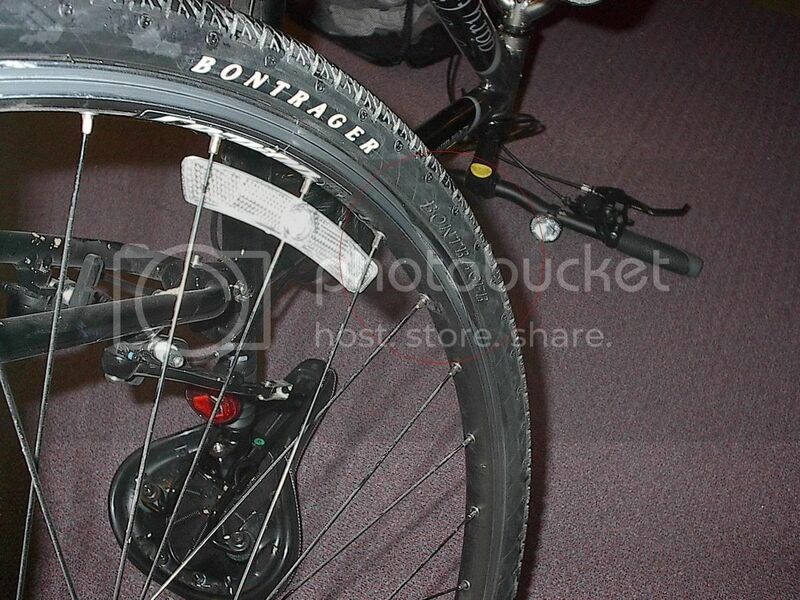 I couldn't find the wheels on the Bontrager site, so I have a silly question...is that groove supposed to be there? I'm not familiar with them, but that looks like a weak point to me. The groove is supposed to be there. I can't tell whats wrong from the pic, is the rim broken or the tire just unseated? Its really hard to tell. Unless you were doing something like Mach5 when you hit the brakes, that's gotta be a manufacturing flaw. Just take it back. Great photo though! the black finish above the groove in the rim where it's broken shows that the brake hadn't really hit the rim in that area, look at the rest of the rim. the brake pad wears off colored finishes. this means that before it was ridden a lot, the rim was bent in in that area. it just cracked at the stress area caused by that groove in the rim's braking surface. usually if a rider does this while riding (by hitting a pothole, curb, etc. )it is a small area with a definite triangle shape and a point, or it resembles a dent or ding. the area is a larger area that the usual ones i see and it could have been a manufacturing defect or shipping damage. i would take it back to the shop and discuss it, but i'm not saying that you couldn't have bent the rim in such a way. 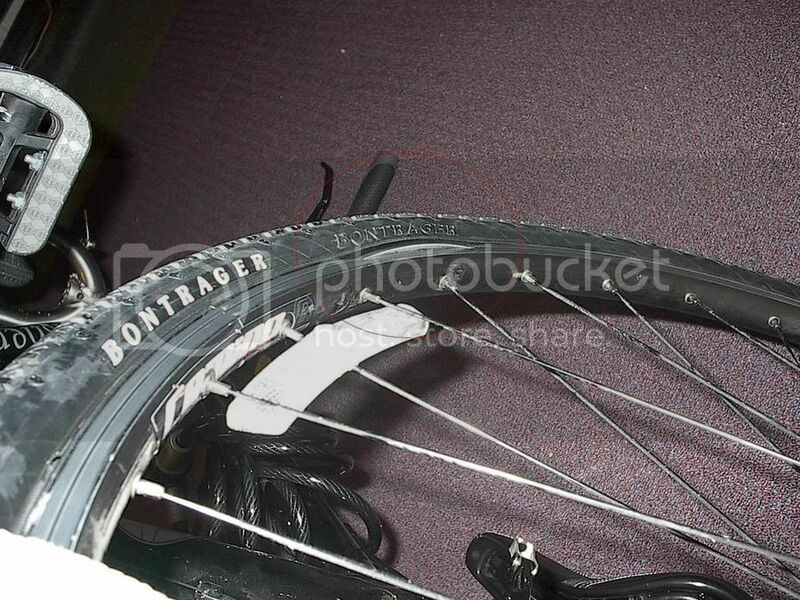 the cord marks on your sidewall are indicative of riding underinflated. it's hard to say with these pictures. i hope this helps some. The groove is a rim wear indicator. When the groove is worn down, you replace the rim. The fact that it's not worn down and the rim still failed indicates that it's faulty. Overpressuring a tire on a sound rim will just result in tire blow-off, not a broken rim.